Sara Zarr’s latest novel, HOW TO SAVE A LIFE, hits the shelves next month, and I can’t wait, because I read it last week and I’m so excited to talk about it with other readers! Jill MacSweeney just wants everything to go back to normal. But ever since her dad died, she’s been isolating herself from her boyfriend, her best friends–everyone who wants to support her. You can’t lose one family member and simply replace him with a new one, and when her mom decides to adopt a baby, that’s exactly what it feels like she’s trying to do. And that’s decidedly not normal. With her world crumbling around her, can Jill come to embrace a new member of the family? Mandy Kalinowski knows what it’s like to grow up unwanted–to be raised by a mother who never intended to have a child. So when Mandy becomes pregnant, she knows she wants a better life for her baby. But can giving up a child be as easy as it seems? And will she ever be able to find someone to care for her, too? Critically acclaimed author and National Book Award finalist Sara Zarr delivers a heart-wrenching story, told from dual perspectives, about what it means to be a family and the many roads we can take to become one. Through the perspectives of two teen girls, HOW TO SAVE A LIFE explores two extremely intense, emotional, and dramatic experiences — the sudden death of a parent and an unplanned teen pregnancy (and all the complications, pain, loss, fear, love, and hope that can arise from each) — in a compelling and page-turning way that never resorts to melodrama or forced emotion. On ever page, through every confrontation and thought, through the internal and external changes both girls endure and bring about, I believed these girls. I knew them. They were just so real. Angsty, lost, deeply wounded by the sudden death of her father and the huge hole his absence has left in her life, Jill MacSweeney is dangerously close to shutting down, shutting herself away from the world. Yet something inside her still flickers, something still open to new love and friendships, no matter how hard she rails against it in her day-to-day life. Naive and immature on the surface, Mandy Kalinowski is understandably desperate for love, connection, and the basic human acknowledgement that she’s a person, that she matters. Like Jill, Mandy has been torn apart by the loss and longing that comes from a broken family. Their lives intersect when Jill’s mother, still reeling from the death of her husband and desperate to put her family back together, decides to adopt Mandy’s unborn baby. She invites Mandy to stay with them in Colorado during the final weeks of her pregnancy so that they can handle the transition without lawyers or agencies. And while not all readers will have experienced the death of a parent and planned adoption of a new sibling like Jill has, or a teen pregnancy and difficult home life like Mandy has, Zarr still brings the story to all of us in personal and memorable ways. Who hasn’t struggled to find their place in the world? Who hasn’t felt the desire to run away, to start again? Who hasn’t doubted their closest relationships, struggled to find “home,” or felt like an outsider in their own families? The story is told in first person alternating points of view, which is a huge and admirable challenge for authors because the characters’ voices and perspectives must be unique, equally compelling, equally important, and wholly necessary. And each alternating scene must cover new ground while at the same time conveying each characters’ thoughts, feelings, and reactions to shared moments and events through their own unique perspectives. Zarr crafts the point of view switches beautifully. I was immediately drawn to each girl for very different reasons, and found myself at times connecting with one more than the other, then my feelings would change, then change again, until ultimately I was so wrapped up in the outcome of their shared story that I simply couldn’t put the book down until I knew how things would turn out for both of them. Zarr has a talent for telling the story. By that, I mean, her books are never weighed down with extraneous detail, melodrama, or flowery, unnecessary language. Like her previous works, HOW TO SAVE A LIFE showcases this minimalist style beautifully, but it also weaves in layers emotion and detail so delicately — almost imperceptibly — that by the last page, the characters will so thoroughly invade your heart that you’ll feel like you’d been through it yourselves, right along with Jill and Mandy. It’s a rare gift for an author to be able to disappear completely from the narrative, and Zarr does it seamlessly. I forgot about her as I got lost in the pages, in the lives of these girls. Zarr makes the storytelling seem effortless — something I admire and appreciate as both an author and a reader. I’ve read and enjoyed all of Zarr’s books, but HOW TO SAVE A LIFE is officially my favorite. It comes out next month (October 18) from Little, Brown, but you can add it to your Goodreads list or pre-order it on IndieBound, Amazon, or Barnes & Noble now. 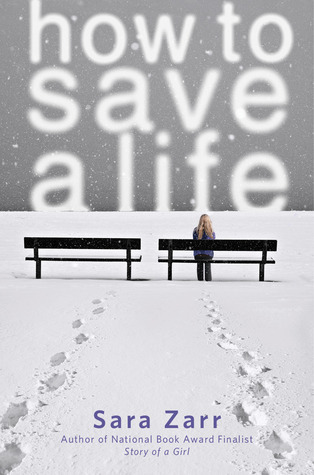 This entry was posted in books, reading and tagged How to Save a Life, Sara Zarr by Sarah Ockler. Bookmark the permalink.